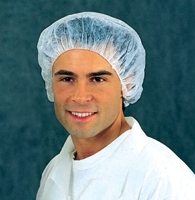 4321 21" White Bouffant Cap, 1,000/cs. 6624BB 24" Blue Bouffant Cap, 1,000/cs. 6624R 24" Red Bouffant Cap, 1,000/cs.